If you’ve ever used Instacart for its convenience and bought a CSA share for its local quality, Local Roots is for you. 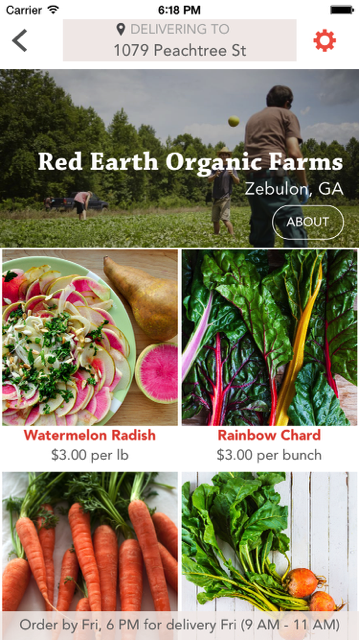 With a clean and streamlined interface, the app allows users to select farms or stores within 50 miles of Atlanta from which they can order produce, cold-pressed juices, handmade soaps, and freshly baked cookies. While the soft launch occurred on March 2, serving consumers in Buckhead and Midtown, expect to see more neighborhoods and producers by March 16. We sat down with the man behind the app, Doug Calahan, to find out more. What made you want to create this app? I was originally trying to solve food security problems, and I kept coming back to this issue where if you want to solve food security, you have to grow food locally. The way that we’ve gotten into this mass production of everything in the world just doesn’t work. The current generation wants authenticity and to know where their food is coming from. I started looking at different models and ways, like the organic model, but what’s happening is that as these models grow, they start running into the same issues that the big agricultural groups did. You need more supply at a cheaper cost, so you end up opening an organic farm in Chile, but it’s right back to the same problem. Any model out there where companies warehouse food and sell to distributors is inherently bad for farmers because the infrastructure costs are so high and farmers make less money. I needed to come up with a solution that was inherently good for farmers, so that I could increase the margins of profits for farmers. The other side of it is, if farmers are selling to Whole Foods, they’re only getting 25 cents on the dollar, which is inherently bad. This app works the same way a farmers market targets a neighborhood, while leveraging technology to fit a consumer’s schedule. We give a farmer a neighborhood where they can distribute goods to the consumer’s door. This way, farmers make better margins and skip the middle man. How is this different from a CSA? One, there’s choice. We make guarantees to the farmers to eliminate that risk. We basically give that same guarantee just to farmers because whatever we don’t sell, we‘ll buy and donate to the Atlanta Community Food Bank. For the consumers, it’s watching to see who’s coming in town and when they’re going straight to the buyer’s door with the items they’ve specifically chosen. Why do you think it will work in Atlanta? From a consumer side, Atlanta has a great population that is all over this. The communities, the restaurants, and the chefs in this city have driven this movement over the last 10 years toward local, local, local. As a city, we’re ready for it and we want locally grown food. For the farmers, we are now seeing an uptick in the number of people farming because small farms are becoming sustainable. We’ve got so much land around the city, and this new generation of farmers are coming through who want to farm organically and create crop diversity. It’s great timing. Describe a typical Local Roots user. I’d say it’s two groups. Millenials are ideal, as they’re extremely comfortable with technology and they’re more focused on eating healthy than the last generation. Another demographic we’re targeting are the healthy moms who watch what they eat, exercise, and want to make good choices for their families but need that convenience. Based on the soft launch and Beta testing, is it working? The reception so far has been great. We’ve still got a lot of operational things that we need to iron out over the next couple of months, however. The first thing people say when they open the app is that it’s just beautiful. When people get the food, they see how beautiful it is. We’re so conditioned to seein food that has been grown thousands of miles away, shipped, and driven to us, but you look at the local food and it’s gorgeous and tastes delicious because it was picked yesterday. You can’t find anything fresher, which is amazing, because we’re not sending it to an aggregated facility and then selling it over the next couple of weeks. You’re buying direct from the farm and the farmer is bringing it right to you. What’s the future for Local Roots? Next week, we’re inputting recipe boards, so whenever you order, you’ll have a link to our Pinterest board. Based on what you order, you’ll see recipes that you can use. It’s something we’ve been wrestling with how to do, but this is really simple. By June, we’ll expand to neighborhoods beyond Midtown and Buckhead.